The BRIC Celebrate Brooklyn! Festival is a beloved summer tradition, presenting world-class free music, dance, and multimedia performances at the Prospect Park Bandshell. CHECK OUT THE BENEFITS OF MEMBERSHIP BELOW! Thank you for an incredible 2018 Season! FRIENDS Memberships for the 2019 season go on sale in late January. Be on the lookout for updates in your BRIC eblasts! 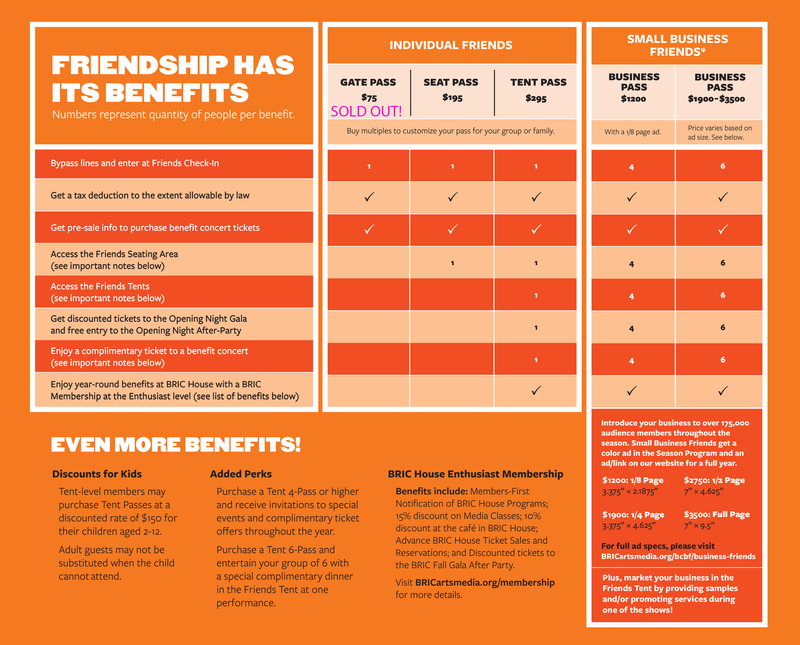 For details on Small Business Friends Memberships, CLICK HERE. All ads must be received by May 4, 2018 in order to be featured in the Season Program. *BRIC is committed to strengthening neighborhoods and communities. This means providing valuable support and exposure to Brooklyn's beloved mom-and-pop shops. Small Business Friends, therefore, are defined by BRIC as any local business with less than 25 employees and three locations. For information on other partnership or sponsorship opportunities for your business, please contact sponsorship@BRICartsmedia.org.